We cat lovers often get short shrift when it comes to finding destinations that cater to our finicky tastes. Recently, Norman and I took a drive that led to unexpected feline riches. Living in the Piedmont region of northern Virginia, we’re within an easy drive of the Shenandoah Valley – but, even for those that live in the metro D.C. region, the Valley is a short hour’s drive west. Just a few minutes further down I-81 South is historic and charming Strasburg, Virginia. We’d planned our trip to revolve around a Friday night Farmer’s Market and dinner but came upon a beautiful art gallery called Ltd Prints. 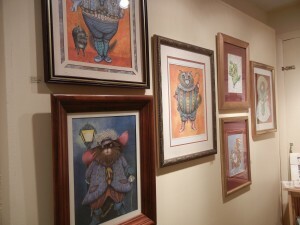 Among all the locally produced, gorgeous art – everything from pottery to oils to mixed media, we found the “cat corner”. 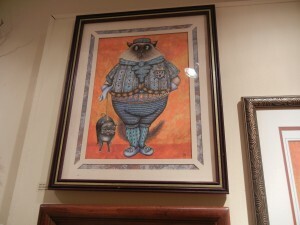 Amazing, fun, unique, whimsical art for feline fanciers! 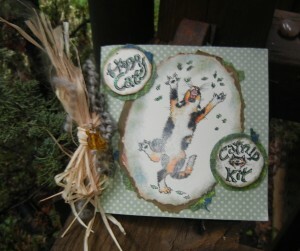 But, that wasn’t all – there were these darling cards and handmade “Catnip Kits”, too! Yummy! After all the shopping and perusing, we were hungry. 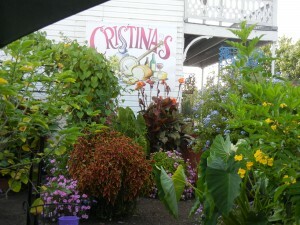 All we had to do was cross the street to one of our favorite spots – Cristina’s Cafe. If the weather permits, you’ll want to sit in the lovely outdoor garden area – surrounded by tropical and flowering plants, you’ll feel like you’re on a mini vacation. 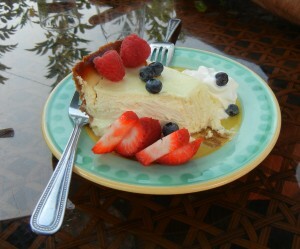 Cristina’s is known for using local ingredients in everything from their baked goods to entrees. Everything is delicious and there are always vegetarian options on the menu. They serve a fine cup of java, as well as an eclectic beer and wine selection. Not to mention Route 11 potato chips. Be sure to save room for dessert – everything is housemade and ridiculously good. And, if you visit on a Friday during the season, you’re in extra luck. There’s a Farmer’s Market in the adjoining parking lot from 6:00-8:00 PM. You will find live native plants and a wide variety of produce and baked goods. We were especially excited to find yellow and purple beans, shallots, and a friendly farmer with a recipe for them at one table. On our return home, Cassie and Fred were especially happy to greet us. Apparently, the catnip in the Kit is especially potent and we had to secure it in the pantry to keep them from overindulging! Fred and Cassie chomping some ‘nip. They were a little disappointed we didn’t bring this one home. This entry was posted in Cat Corner and tagged cat, cat art, cat destination, cat lovers, farmers market, local restaurant, Shenandoah Valley. Bookmark the permalink. Post a comment or leave a trackback: Trackback URL. 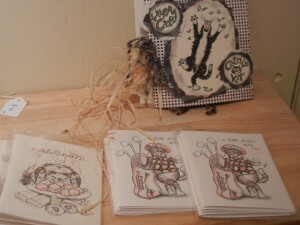 I am so happy that Fred and Cassie enjoyed the catnip from Ltd. Prints. Every kitty is better than the one before, and you may quote me on that! By the way, I have had so much catnip this year; the pollinators had a feast. A lady at the market asked about catnip, I told her stop by my house and have about all you might want; I even potted some up but have not seen her since. I had a cup of Yucatan Lime Soup recently that touched almost all my senses: sight, fragance, taste, texture. I’m kinda glad it didnt’ speak; the music afterward did, however, cover the sense of sound. Also, not finally as the jardin es bellisima, there is the lovely hostess, Crissy, and her lovely staff: Tori, Hailey, Tameka and others. Crissy’s sister, Wendy, currently attends Humboltd University in California, and their mom, Dona, have contributed a lot to the experience that Cristina’s has been for me. Like the Smithsonian, you will not receive the entire exerience in one visit. I saw my first and only immature ( only about an inch ) praying mantist which somehow showed up on my lower arm, very interesting. So glad we can put a name with a face now! Watch out – our fellow cat loving friends may bombard you for that unclaimed catnip. Cristina’s is such a jewel. That Lime soup sounds delightful. We only wish we were closer so we could be regulars! That praying mantis must have known it would be safe with you. We were enthralled with the angel trumpet, along with everything else. Tonight we make the bean/shallot salad. Thanks to you and all the hard working farmers out there for providing us with delicious, clean, local food. We hope to see you again soon. So glad you’ve discovered our little corner of the Shenandoah Valley. Not only does Cristina’s Cafe have fabulous food, a splendid seated patio area, and Farmer’s Market, they are also a Virginia Green certified restaurant. 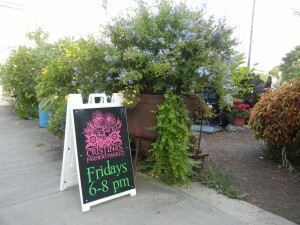 In addition to all that, Cristina’s helps promote art and local artists. Next time you visit, I invite you to view my art inside the restaurant. Diane, we love that! Next time, we’ll be looking for your artwork and we hope sometime to be there for the live music, as well. I enjoyed having you visit the shop and the photos of Fred and Cassie have put a huge smile on my face. Both my sons are cat lovers, as am I. Thanks for the post about our lovely little town and the new Arts and Tourism District. Also, remember I can always ship something to you if you’d like.